As I’m sure many of you have found, the recent controversy surrounding plans for fracking has rather inconveniently meant having to do a fair bit of research on the subject ourselves. Pretty soon we all encounter our first major problem- whose science do we trust in what has become an increasingly hyperbolic and emotive energy debacle, err sorry debate? The UK coalition government- the greenest government ever remember – has shown startling leadership over this question of who to trust with the recent appointments of a number of industry experts into government. The words ‘regulation’, ‘robust’ and ‘fit for purpose’ have been repeated mantra-like by policy makers who, simultaneously it seems, have been busy formulating Local Authority Proposals aimed at relaxing regulations in UK onshore gas – most noticeably article 10. Despite these new UK Government proposals which aim to eliminate the need to notify a tenant as to the intention to drill under their property, we are told our regulations are tougher than those of the USA, where landowner permission is not only a legal prerequisite but highly economically rewarding. 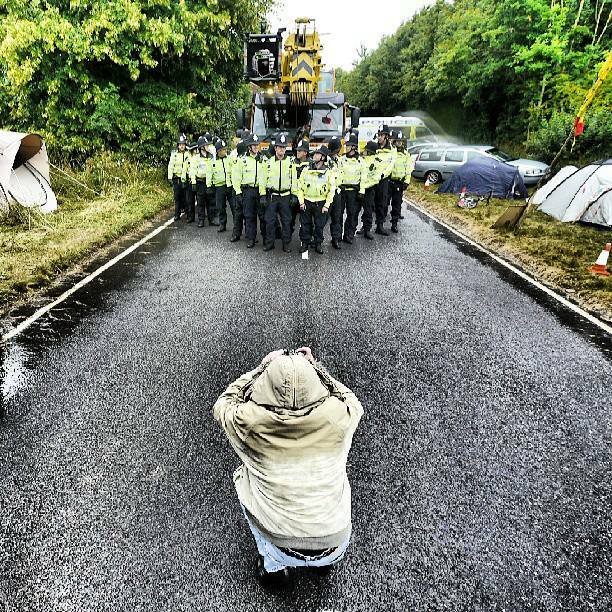 In this midst of this feverish greenwashing frack-fest, anti shale gas campaigners have increasingly been portrayed as ill informed, over zealous and, at times, nothing more than a motley crew of professional activists, benefit scroungers, hippies and assorted nimby’s – all of whom costing the UK tax payer in mounting police costs. If onshore gas is the answer to our energy needs will Cameron address the issue of escalating policing costs at the Tory Conference? £2.5millon has been spent policing one well site so far, how many wells do we need to reduce gas prices and achieve energy independence? What would the combined policing costs likely be? Evidently, it does not seem the government has any problem reconciling a potential new global gas bonanza with the considerable scientific consensus behind the recent IPCC findings. Their conclusions indicate we must leave hydrocarbons in the ground to avoid catastrophic climate change- a message that seems already to have been lost in the 24hr news cycle. It’s the Tory conference and we need to hear how Cameron’s vision of ‘Big Society’ has empowered local communities like Balcombe. Its only catastrophic climate change after all……. In a political environment where terms like financial sustainability are used with a straight face, words are everything and democratic leaders are able to say that fracking is not only compatible with, but complementary to meeting our carbon reduction requirements. In the same way W.S.C.C. has been able to say Cuadrilla’s operations are compatible and complementary to its own A.O.N.B. Management Plan objectives – those of minimizing the consumption of fossil fuel and water and safeguarding human health, the landscape, flora and fauna and soil, air and water quality. Amazingly, in the continued absence of defining criteria from the D.E.C.C. as to the methods that constitute hydraulic fracturing, the public is being told that Cuadrilla have not fracked, nor have plans to despite having been given a fracking licence from the W.S.C.C. In the absence of defining criteria it awaits to be seen if techniques such as acid etching and matrix acidizing constitute hydraulic fracturing treatments. Regardless of the DECC response to this, it begs the question as to which unconventional extraction treatments require extra regulation and which do not. I am expecting a reply from DECC to some of these questions by the end of the month so may have more news for you then. ← Astroturfing in Gasland- Are Dart Energys’ employees blogging in work time?